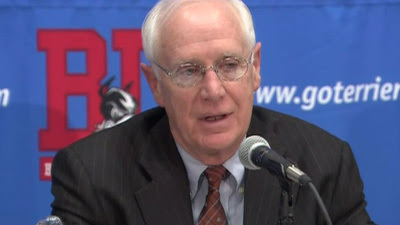 Concluding four decades of head coaching at the highest level of college hockey and doing so without undue fanfare, Terrier Head Coach Jack Parker announced, on his 68th birthday, that he’ll step down at the end of the current season. "I didn't want to go through a farewell tour of the other rinks in the league," he added. "At the same time, I didn't want to wait until the end of the year when all the games were over. With his contract extended through 2018 and a new role as special assistant to President Robert Brown, Parker will remain involved with the University’s ambitious $1 billion fund-raising campaign, announced last summer, and he will play an active role in selecting his successor. Among the throng of former Terriers who turned out to honor Parker were his first three captains, Ed Walsh, Vic Stanfield and Peter Brown, each of whom gained All-American honors under Parker. Current captain Wade Megan said, “He's not just a hockey coach. He's a life coach. I'm just grateful that he, not only gave me the opportunity to play here, but gave me the chance to be captain." Parker’s rival and friend BC’s Jerry York said in a statement: “Jack and I have enjoyed a relationship that has stood the test of time. “It goes back to our high school days and dates back 50 years. We’ve competed against one another and we’ve coached against one another for a long, long time." He added, "There have been so many unbelievable games that have provided countless memories for the both of us. From recruiting to coaching against one another in big games, we’ve maintained respect for one another. Other alums who joined the current Terriers at the event included Pat Aufiero, Mike Bavis, Don “Toot” Cahoon, Colby Cohen, Jon Coleman, Brian Collins, Cleon Daskalakis, Robbie Davies, Dale Dunbar, Brian Durocher, Mike Eruzione, Peter Fish, Dennis O'Connell, Paul Giandomenico, Mike Grier, Kevin Kielt, Scott Lachance, Peter Marshall, John McCarthy, Bob Murray, Chris O'Sullivan, Kevin O'Sullivan, Buddy Powers, Tommy Ryan, David Sacco, Mike Sylvia, David Silk and Brad Zancanaro. ►Tomorrow, Parker will be back to his coaching duties, preparing for the Hockey East quarterfinal series with Merrimack and participating in the conference coaches media teleconference. ► From the New York Times, a feature on Elliott Dribben, whom Parker calls "BU's greatest fan" and whose relationship with BU athletics goes back even further than Jack Parker's head coaching career. 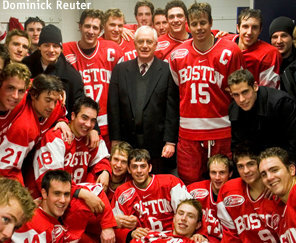 6 more wins would put BU into the Frozen Four and get Coach Parker to the magic number of 900. Can it be done? Wouldn't that be great? Of course 902 and a National Championship would be a great retirement gift.